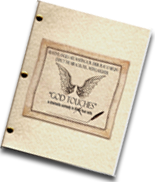 The Prelude to God Touches is the playful mise-en-scène of the above synopsis and optional to productions. It was left out of the premiere to keep performances under two hours, though it adds a baklava of humor to the role of its Chorus, Michael, the seraphic messenger who revises the script he is sent to deliver. 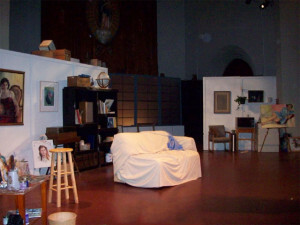 It is presented here to tell a little ‘more about the play,’ and shows its original authors, Shakespeare and Saint Paul, walking through their set (above) – unbeknownst to them here, changed from a Convent to a Painter’s Loft – already a glimmer in the mind of their servant in a quantum’s stretch of time and space. The LIGHT OPENS on JULIA as she walks to center stage beaming with confidence and genuine affection toward the audience. Her position triangulates two black boxes or cubes at the stage’s edge. The LIGHT CLOSES on Julia as she leaves and OPENS ON THE TWO, standing behind the audience as they start down the aisle toward the front of the stage. They step between the cubes onto the stage. They EXIT together. The hot plate’s diminishment brings down the LIGHT.